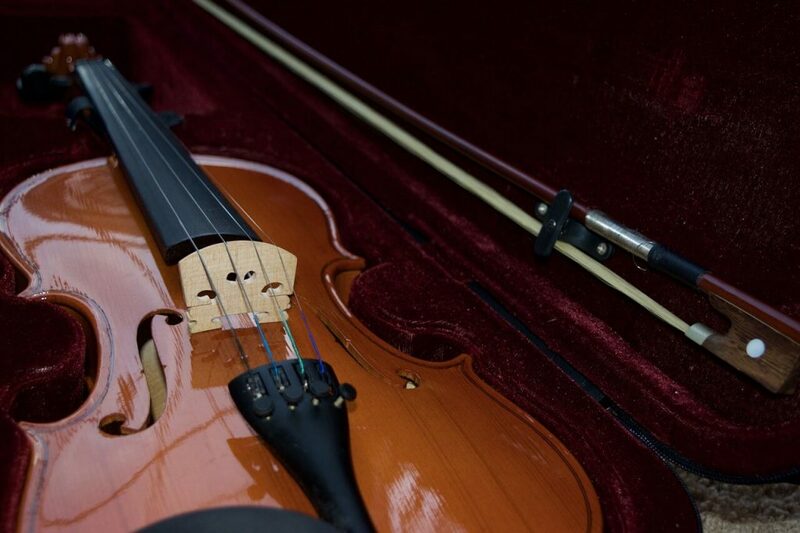 Frequently, violin dealers sell their best beginner violins with an entire outfit of equipment, including a bow, rosin, and other essential knickknacks. Along with these items often comes a case – just the thing violinists, guitarists, cellists, and most other instrumentalists need to defend their babies. Cases come in many forms, from hard-shelled and lightweight to soft-covered and bulky. 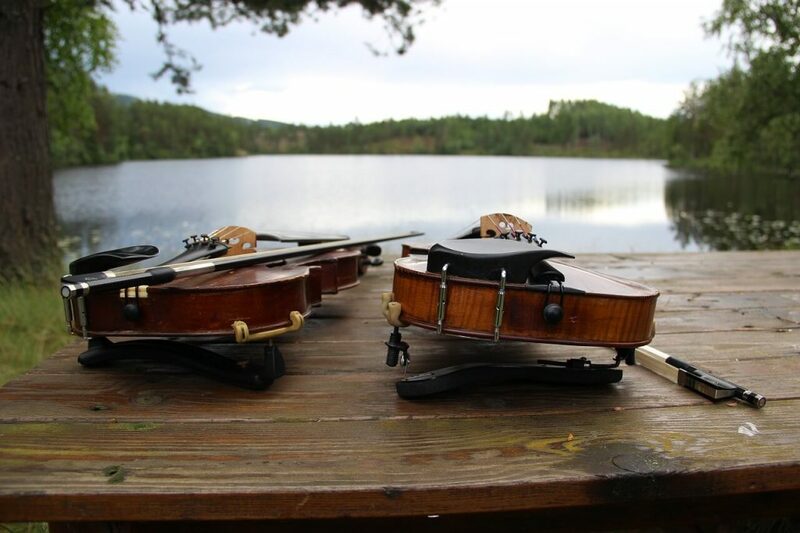 Picking between them is a matter of discerning how much equipment will be carried, what the size of the violin is, and how much weight one is willing to lug around a given area. Also, as style is especially important for a travelling artist, the visual appearance of the case is a key element to consider. With hundreds of color options, unique materials, and interesting designs available, finding something appropriate for your aesthetic is highly probable – there is something out there for almost everyone. Even if the metallic blue case with the Chinese calligraphy you had in mind is not available, customization is, and willing manufacturers can gladly make a new object for a pretty dollar. What to Find in a Standard Case? This part plays a key role in keeping the instrument well-confined and tightly-kept. Without a good, imbedded space, the musical object is prone to wiggling about; if the equipment does not get banged up completely, it will at least ding against the other hard objects in the case, leading to marks and scathes that cannot be erased. The metal nut on one end of the bow is enough to cause significant damage to a wooden instrument – too much space for an instrument to flail about in can lead to serious consequences. So, before you purchase a case, it is recommended that you make sure that the limited space, firstly, exists, and determine that it is suitable for your instrument’s size. There should also be a preset area for the bow to fit into; it should be a long, skinny, and inwardly-curved, so that the bow can rest comfortably in the socket. A strap, typically of Velcro, should be where the neck of the instrument is placed. The lasting quality of this strap is vastly important, as it is the part most responsible for keeping the equipment safe. The area designated for the bow should include a holder near where the bow’s tip belongs. A twistable lock is near where the frog of the bow goes – this and the holder fasten the bow firmly, preventing it from coming into contact with the instrument. 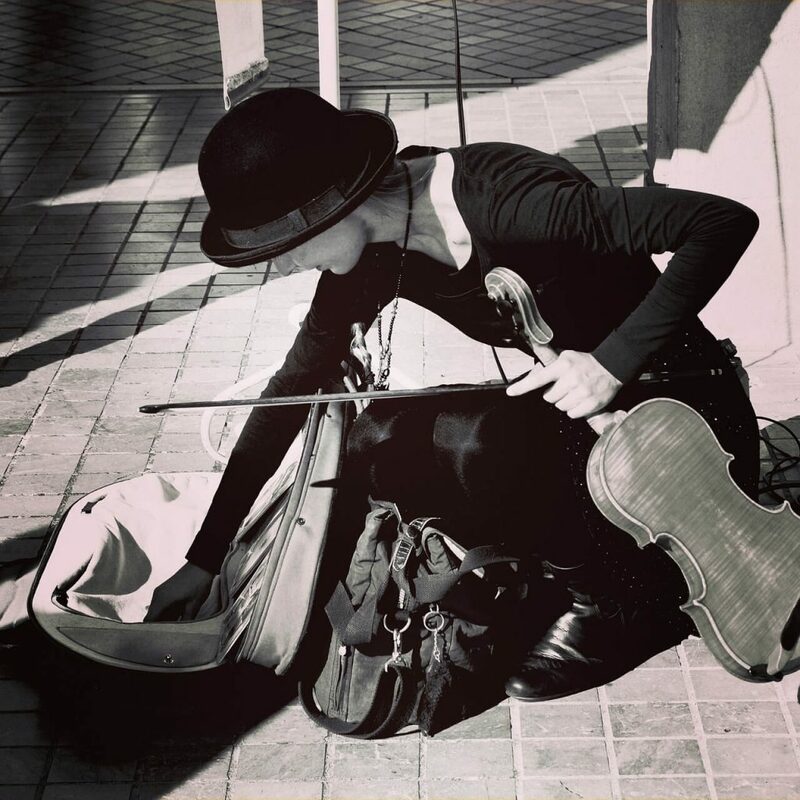 Violinists, violists, cellists, and others carry, in addition to their instruments, rosin, shoulder rests, cleaning supplies, extra strings, and other tools unique to their circumstances. Without a container for these utilities, musicians would have a much bigger burden than they are already have, and many who are active today would likely not be. So, at least one sizable pocket should be found in a given case. A large pocket is usually found near the instrument’s fingerboard, where a player can easily reach to equip the item she needs. It should contain enough space for a shoulder rest, rosin, and a cleaning cloth to sit in. Often, extra pockets for other equipment are found somewhere in a case – one might be lucky enough to find three or four in the tight chamber of his pack. If these are included, enough room should exist in the case for extra strings, an extra bridge, and even a snack. Another element of most cases is the zipper container in which musicians keep their music and binders. This should be bigger than a large piece of sheet music, and should be able to hold a solid book’s worth of papers. Without this, musicians would be running around San Francisco, desperate to retrieve the original copies they were given after rehearsal. These containers typically have zippers to ensure that the components inside remain safe, through wind and calm. These are all the necessary parts of a case. If the case you are considering does not bear any one of them, to reconsider considering is advisable, as there are more-versatile and useful options out there. Though it is fantastic for the everyday grind of a musician, sometimes, just a case is not enough to defend against whether conditions. Harsh wind, rain, and cold can swipe the equipment from a hand, make sheet music soaking wet, and detune an instrument severely. So, taking a few actions is advisable, and can prevent some of these incidences from occurring. If rain suddenly strikes as you walk across the massive parking lot, the sheet music that the zipper container of your soft case holds is bound to become damp, if not completely soaked, by the pattering water drops. This can slow down a day meant for practice and lessons, and can even hinder a career by impeding an audition. A blanket can be brought to defend against the rain. If the object is stored neatly in the trunk or backseat of a car when grey clouds the sky, one should have no trouble wrapping it around the case before being on her merry way. One or two complete coverings of the case should be enough to defend the insides against light rainfall, granting the user the ability to calmly cross the lot. A blanket is an excellent tool to have even in dry circumstances. On a train, for example, one might consider using the object to stop a case from banging against hard suitcases, and to keep it safe if it falls off a shelf. As small blankets and soft jackets are typically not too cumbersome, this should pose no issue, even in the confines of an airplane compartment or bus shelf. A hygrometer is used to measure the amount of moisture that is in an atmosphere. Some violin cases come with this useful item, and it can be used to determine the state of an instrument’s surroundings. The amount of moisture in the air directly affects the instrument’s size, shape, and sound. The more moisture that is present, the more-greatly an instrument expands – the water molecules work their way in between the wood, causing it to bend and pull apart in the process; with a decrease in moisture comes a decrease in instrument size. These changes can be drastic and detrimental. Only so much can be done to stop changes in humidity. If the room that the player is practicing or performing in contains a humidifier, it is advised that the player turns the device on and sets it to a constant level. This will prevent changes in a given instrument’s size and shape, and will allow for a consistent tone to be emitted. Some whole-house humidifiers, as well as room-based ones, are available. Recommendable personal ones include Vick’s Easy Fill Cool Mist, PR System’s One 60 Series, and Honeywell’s Ultrasonic humidifiers. All of these can be used to control the moisture that is present in a room; with one of these and a precise hygrometer, one cause of worry is removed. There are some makers of superb instrument cases out there; these are particularly well-acclaimed. One user stated that a truck ran over a Hiscox case that contained a Gibson guitar. Though the case was damaged, the only sign of an accident on the guitar was a dink in its paint. Hiscox makes cases for a range of instruments, from rock instruments, to orchestral and band instruments. Jim D’Addario, of D’Addario & Company, Inc., wrote that a Hoffee guitar cases “puts all the cases in [his] collection to shame”. With colored insides and exteriors made of carbon fiber, the company has a large selection of gorgeous guitar, violin, and mandolin cases, as well as others. The String Centre is a maker of instruments, bows, and other musical equipment. Well-reviewed, the company’s cases are durable, fully-equipped, and suitable for players of all tiers. They are beautiful, too, and sell for an affordable price. If a travelling musician follows these tips and seeks out cases that follow the standard mentioned, his or her instrument should be well on its way to being safe. Many other practices can be used, but these should at least provide a solid starting foundation. Also, we have an in-depth buying guide for those looking for the best violin case, don’t forget to check it out. You will find lots of useful information there.